Ahh! All that green is reflecting up at me! Photo of the Spring Street Green Buffered Bike Lane Opening via Jan Perry. Yesterday, the Los Angeles Times weighed in on the debate over whether or not the city should, or shouldn’t,repaint the fading Spring Street Green Buffered Bike Lane. The editorial calls for the lane to be repainted, but only after the city tries to find a shade of green that works for the filming industry per their representatives at Film L.A.
It’s always nice to call for a compromise, but one thing the Times is missing is that the current state of play is a compromise. The city, with the full support of the Downtown Los Angeles Neighborhood Council, originally planned to paint the Spring Street Lane going south green AS WELL AS the Main Street lane that runs on a parallel street green going north. Film L.A. managed to squash this second part of the proposal. If every time the Spring Street Lane is up for painting the city “compromises” then advocates for safer streets will see the the lane getting less useful every time it’s up for painting. Maybe it’s time for advocates to call for painting the Main Street lane green as well, so we’re not starting from the current state of play with any “compromise” reducing the value of existing infrastructure. I will add that when discussing the editorial with some of the city’s bike advocates, off the record because this was an off-the-cuff conversation and not a policy of their organizations, it was repeatedly suggested that a good compromise should involve the city using the kind of paint that won’t fade in just one year. Even with all of the press on the terrible impact that the green paint has on filming in L.A.’s historic core in Downtown Los Angeles, we still don’t have a great idea of data backing the argument that the lane with its current paint is bad for filming. We know that they claim that the paint and its reflective surfacing makes it harder to edit. After we showed the world that taking the lane out really isn’t that hard in post-production, the story changed a little. Now its the reflection, not the paint itself, that’s really super hard to edit out. So here’s our challenge, we’ll show you our data and ask that you do the same. We can show the benefits of both green bike lanes and the Spring Street lane in particular, with data. If you tell us the extra cost of this editing and what percentage of a budget it would be, people can decide what is worth more. Also, could you please tell us cost be of temporarily covering the lane and editing the covering in post production? Without this data from you, we really can’t gauge the seriousness of your argument. There's a wealth of data on the value of the Spring Street Green Buffered Bike Lane. There's a dearth of value on the cost to Film L.A. of the magic green paint. First, highly green reflective paint saves lives. The Texas Transportation Institute recently released “An Investigation of Longitudinal Pavement Marking Retroreflectivity and Safety.” This study demonstrates that the brighter and more reflective paint is, the safer the road is. Based on the data in this report, the FHWA is developing a “retroreflectivity standard” to guide Department’s of Transportation to decide when and how to repaint bicycle and pedestrian markings. Without knowing the exact paint used, and what Film L.A. recommends replacing it with, we can’t give exact information, but we can state that bright, new, reflective paint creates the safest atmosphere for bicyclists. When it comes to specific data on the Spring Street lane’s usefullness, there’s a lot more hard data thanks to the Parklet Studies team. While this team is collecting data on the new parklets, they recently released their own report on the usefullness of the bicycle lane. In short, the lane is working. Bike counts on Spring Street show a 40% increase in ridership in early 2013 compared to early 2012. One of the largest gains was during morning rush hour which saw a 100-122% increase in ridership in the lane. It’s not just commuters who use the lane, in fact the busiest hour of the entire week is between 11 am and noon on Saturday. Remember, every person riding in the lane is one that’s not riding in the sidewalk. Parklet Studies did a traffic count, not a survey, so we don’t know how many of those riders on the lane are new to the street and how many are coming to the lane from the sidewalk. Regardless, there is little doubt that the green lane is making the sidewalk safe as well as the street. Businesses near the lane are happy too, and not just those on Spring Street. The Parklet Studies report shows that business is up in several blocks in either direction of the bike lane. Sadly, there is some bad news. On a weekday, 15 percent of riders were going against traffic, while on the weekend, this balloons to 44 percent. The city average is 4 percent. This can be attributed to the fact that the Spring Street Green Buffered Bike Lane is unique and cyclists feel safer salmoning than riding legally. It’s too bad Film L.A. managed to squash plans to paint Main Street’s buffered bike lane green as well, or the unsafe salmoning outlier would likely be non-existent. There’s a lot more data in the report, which can be read here. 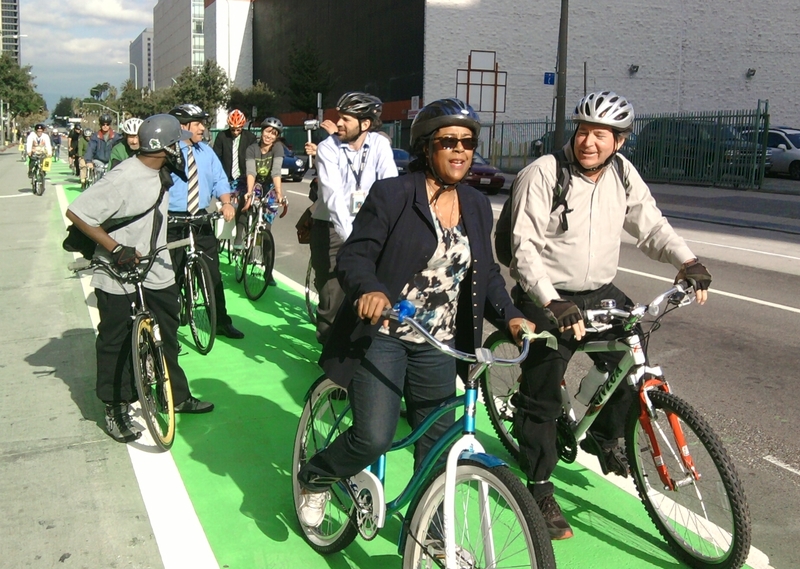 You can also read the LADOT’s summary of the report on the LADOT Bike Blog. Paul Audley, the spokesperson for Film L.A., is framing the issue well if we assume his real goal is to increase film subsidy citywide. The media is presenting his “argument” as equal to the ones of the residents, activists, bicyclists and city council members despite that he has offered no proof filming has decreased on Spring. A note to the Times and everyone else covering this story: don’t subscribe to his narrow frame. The design of public safety infrastructure should not be affected by his agenda, or solely the agenda of any one stakeholder – period. There are other ways they can adapt to the changing neighborhood in which they are guests that shouldn’t affect how our roads are designed. Thanks for asking this question. I get that editing out the green paint isn’t all that simple, and reflections create further issues, but covering up the bike lane seems like such a simple solution that would solve virtually the entire problem. I’ve never heard a satisfactory answer as to why this isn’t an option. Copy editing comment: you’ve got kind of an awkward sentence here, no? Well said. As someone who has used the Spring Street lane to commute downtown by Metro and bike, I am deeply disappointed in the LA Times’s repeated sloppy reporting and editorializing on this issue and lack of consideration for the safety of bicycle commuters. Oh, and because I feel safe riding a bike downtown, I am contributing one less car that would otherwise add to traffic congestion, noise, pollution, and parking problems downtown. Thank you, Streetsblog. The L.A. film industry can create entire alien worlds with technology but is totally stumped with a patch of green paint on the road? I haven’t seen the reflection argument in print. Does anyone have a link? If we gave up continuous green paint could we get painted bicycle boxes, painted guides inside the intersection, painted conflict zones and some bollards in return? Maybe they can film the new matrix trilogy there, it will actually save on the green tint in post production, then we can apply that savings to the increased cost of color correcting the rest of the films made here. It was in yesterday’s LA Time’s editorial. It was kind of an added line to the removal of the paint in post. Update: Did LA Cyclists Just Get Hosed by Unanimous Vote?